Constance, Patience and Min like this tiny garden in a pot. It is very nice to try and see things from a Hitty perspective. In this part of the garden it was not at all difficult! That is a sweet little garden. I am thinking of making the Hittys a “fairy garden”….still in the planning stage. Your photos are giving me some good ideas. Oh, the Country Hittys would love a fairy garden! Thanks for such lovely photos of your beautiful Q Hittys in their colorful kimonos in such “quaint” settings. It is all very peaceful and so doll sized. We were amazed at how the huge trees could be persuaded into such delicacy. 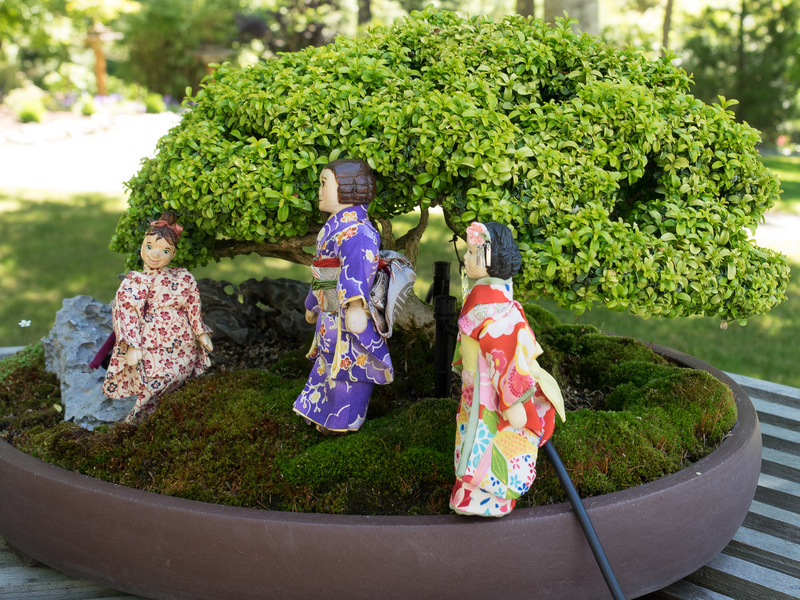 The Quimper Hittys were appreciative and grateful for the gardeners of 75 to 100 years ago that made it possible for them to enjoy the bonsai now.